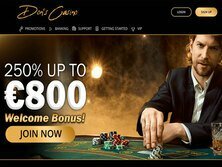 Newly registered customers at Don's Casino will be treated to a marvelous welcome offer consisting of a 250% welcome bonus up to a maximum of $800. The welcome bonus can be used on a plethora of games and only comes with a playthrough requirement of 20 times the sum of your bonus and deposit amount before a withdrawal request will be accepted. Please keep in mind, however, that players residing in Lebanon, United Kingdom, or Greece will be subject to wagering requirements of 40 times. Casino Don's also comes equipped with a terrific second deposit match bonus, allowing players to claim a 200% match bonus up to a maximum of $1,000 on their second deposit. The 200% match bonus up to $1,000 also boasts with a playthrough requirement of 20 times, enabling players to achieve the playthrough requirements in a much shorter time frame when compared to other sites. Apart from the welcome bonus and second deposit bonus, Don's Casino also impresses with an innovative 15% cash back promotion every Friday. The site will calculate all deposits made for the week and credit your account with a 15% cash back coupon based on your deposits made as oppose to your losses for the week. In addition, Don's Casino offers a brilliant VIP loyalty program with 4 different tier levels, including Black, Platinum, Gold, and Silver. Players will receive 1 VIP point for every $10 wagered and the higher you climb up the tiers, the more rewards you will unlock, including a dedicated VIP manager, exclusive promotional material, tailor-made offers, bonus voucher based on the games you play, and more without the need to download an app. When we compared Don's Casino to Split Aces, which is a sister casino operated by the same company, we discovered that Don's Casino is more superior when you take into account the low wagering requirements on bonuses, regular no deposit promos, the excellent variety of payment methods, and the number of games offered by the site on desktop and Android and Apple iPhone and iPad mobile devices. Casinos Don's is a new site that caters to enthusiasts around the world. Its primary focus is around the European market but also accepts players from other countries, hence the 8 currencies and the 10 supported languages available on the site. Although it's considered a new casino, there's already a huge player base from Canada that predominantly resides in Ontario and British Columbia. Don's Casino boasts with well over 1,000 different casino games, including video slots, live dealer games, card games, classic slots, table games, VIP games, Jackpot games, Micro bet games, video poker, and action games. The games offered at Don's Casino are provided by several software developers, such as Xplosive, Playson, Mr Slotty, GS, Wazdan, 1x2 Gaming, Leap, Irondog, Noble, Felix Gaming, BestSlots, Booming Games, EvoPlay, Fugaso, SA Gaming, Betsoft, and Booongo. Each game at Don's Casino can be enjoyed on desktop, mobile, and tablet devices, including Android, iPad, iPhone, and Windows devices. The bulk of the games at Don's Casino are video slots and the most popular slot games that players can look forward to including Power of Asia, Nights of Fortune, Claws and Paws, Golden Shot, and Golden Girls. Players will be pleased to know that these video slots comes packed with a wide range of features, including free spins, multipliers, bonus rounds, re-spins, and more. There's also an excellent variety of table and card games, such as roulette, blackjack, baccarat, and Keno along with a handful of video poker variants, such as Jacks or Better, Caravan Poker, and Magic Poker. Players will even be able to enjoy an immersive experience thanks to a variety of live dealer games, including Blackjack, Roulette, Baccarat, and Hold'em. Don's Casino comes equipped with 28 different progressive jackpot games, providing plenty of opportunities to unlock a life-changing win. Some of the most popular progressive jackpot games include Yakuza, Mr. Toxicus, Fear the Zombies, Jewel Sea, The Giant, Book of Tattoo, and Trump It. Even though the casino is still new, there's already been some decent wins on the site with figures that reach into the thousands. As a brand-new casino that was only launched in early 2019, it's no surprise that the operator hasn't received any player complaints since its inception. Everything about the site is excellent and the sister brands of the same company are also in good standing when it comes to complaints. This means that it offers a fantastic feedback system with great customer support to ensure all players queries and requests are resolved in a timely manner. We will update this section if there's anything to report but for now, we will give Don's Casino a 5 out of 5 rating. The casino is owned and operated by Alpha Interactive Solutions N.V and is licensed and regulated by the government of Curacao. Casino Don's opened its virtual doors as early as 2019 and is regularly tested for fairness on all games by independent auditing companies while utilizing a random number generator which guarantees fairness with every bet you place. 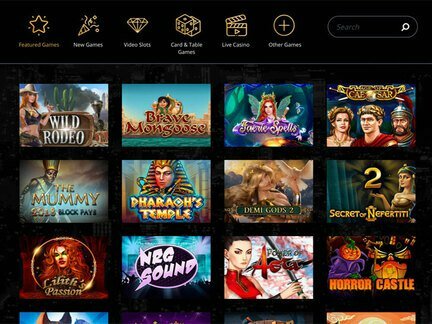 As a brand-new addition to the online gaming industry, Don's Casino ticks all the necessary boxes, but it can be better. Newly registered players aren't welcomed with free spins or no deposit bonus coupons and there's also no additional promo for those that play over weekends. Registering a new account is extremely easy, only taking a few seconds to fill in your personal details, and claiming the welcome bonus is just as simplistic as everything is automated with no additional vouchers required during the registration process. The overall graphics of each game is superb and the layout of the site is sophisticated and easy to navigate. The site utilizes a gold and black colour scheme which is quite captivating when you first land on the page. You will definitely feel welcomed at Don's Casino and will be able to reward yourself with more than 1,000 games and a terrific VIP program.